On the day of the National Championship game, Chris Loupe and I decided to make a morning fishing trip to the Salvador Management Area. Launching at the end of the road in Bayou Gauche, Loupe cranked up the 35hp pro-drive and we headed south in Bayou Des Allemands. Reaching the Fontenot Canal, we made a left turn and ran through the marshy section of Baie Des Cabanage to reach the Gulf Canal. On windy days, this is the safest and smoothest ride to reach the Gulf Canal. Otherwise, a hunter or fisherman would have to cross Lake Salvador or Lake Cataouatche. Today the winds were out of the southeast at 10-15 miles per hour. We reached the Gulf Canal around 8 a.m. and began throwing red/white/chartreuse and blue/chartreuse mini jigs rigged 15-18 inches under a cork. We also used the 3/8-ounce red/chartreuse spinner baits and the watermelon/red baby brush hog rigged Texas style with a #5 worm hook with a ¼ ounce slip sinker. We found clear water from the fence along Alligator Pond into the Gulf Canal and up to the North Canal. We targeted the points of each canal looking for grass beds and downed tree tops. Within minutes Loupe caught a nice bass on the blue/chartreuse mini jig. 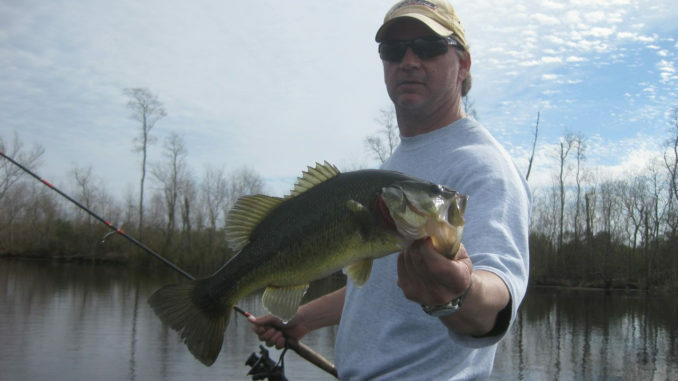 We fished numerous points picking up a few sac-a-lait and bass and then we would move to a new location. We moved to the North Canal and found gin clear water in a canal off the Western side. Again we targeted the grass bed along the outer edges of the points. Sac-a-lait and bass were biting steady. On our way back, we stopped at the pickets known as the fence. We each caught a nice bass, one on the mini jig and another on the spinner bait. Keeping a handful of sac-a-lait and throwing all of the bass back, we called it a day around noon.